Sport England describes rock climbing as one of the greatest challenges of human strength, skill and endurance and one of the most rewarding sporting activities. Rock climbing has many benefits to mention a few it develops muscle tone, improves flexibility, improves coordination and enhances focus. 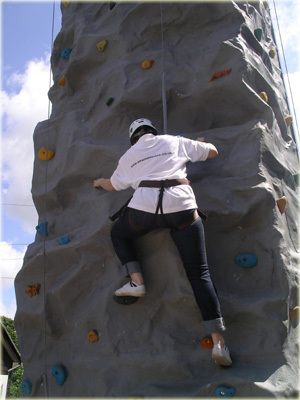 Our Mobile Rocking Climbing Tower enable us to bring a variety of climbing activities to your school so children can experience the fantastic sport of rock climbing. We understand the pressure that schools and other organisations are under to provide learning outside the classroom. With our Mobile Climbing Wall, we can bring outside learning into the school grounds without the cost and hassle of transporting children to a location. Our Portable Climbing Tower can be used for a number of the curriculum subjects. Would you like to add an exciting twist on your Physical Education lessons or maybe your class is studying mountains in Geography? Rock climbing can be used to enhance and encourage learning while giving students an amazing experience. When we attend an event, a First Aid Trained operator always attends and operators have valid Enhanced CRB Disclosures. We are also covered by our own Public Liability Insurance allowing us to bring the extreme sport of rock climbing into the safety and familiarity of the school grounds. If you are interested in us attending your school to run a single rock climbing session or a full course, or an exciting fun day full of activities, please contact us where we will be pleased to discuss your requirements.